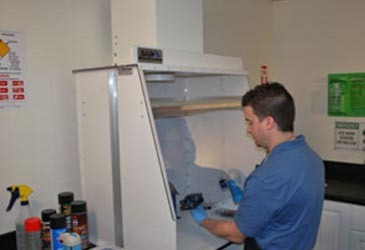 Containment Hoods for Epoxy Overspray - Sentry Air Systems, Inc.
A Model SS-330-DSH Ductless Spray Booth is pictured above. Epoxy is a useful tool, but may also pose health risks that can affect the respiratory system, skin, and eyes. For more information, read this blog entry on the respiratory hazards of epoxy fume. It is also helpful to review this product’s MSDS (Material Safety Data Sheet) for detailed information. Sentry Air’s unique and patented Ductless Spray Hoods are equipped with a powerful fan and triple-stage filtration. Particulate and fume first pass through a MERV 8 internal spray filter that is designed to capture heavy overspray. The second filter is most commonly a HEPA Filter [up to 99.97% efficient on particles 0.3 microns and larger]. This filter media is engineered to capture smaller particles that pose a respiratory concern for the operators and those in the surrounding area. The final filter is a heavy-duty Activated Carbon Filterthat absorbs chemical fumes found inside the epoxy. These highly efficient systems do not require external ducting or makeup air and are an excellent choice for those in high-rise buildings, those without external venting options, and facilities with limited amounts of space. Ductless Spray Hoods recirculate filtered air back in the immediate area. For more information on Ductless Containment Hoods for Epoxy Spray Control, please contact Sentry Air at 1.800.799.4609, email us at sales@sentryair.com, or fill out this formfor more information.